Frodo Baggins is the well-known “ringbearer” and hero of Tolkien’s Lord of the Rings trilogy, in which he undertook the quest to carry the One Ring to Mt. Doom in Mordor where it could be destroyed. Frodo’s parents, Drogo Baggins and Primula Brandybuck Baggins, drowned in a boating accident on the Brandywine River when Frodo was still a child. Several years later he was adopted by his well-to-do cousin Bilbo Baggins of Hobbiton, who made Frodo his heir. 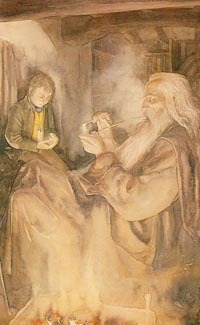 Bilbo was the hero of Tolkien’s first published work of fiction, The Hobbit, and acquired wealth and knowledge in his adventures with the dwarves. He taught Frodo Baggins a wealth of information about the other peoples and languages of Middle Earth. Frodo grew up in a very different atmosphere than the other hobbits of Hobbiton, where ignorance of the outside world was encouraged. Bilbo and Frodo also shared the same birthday, September 22nd, and in the year that Bilbo turned “eleventy-one” and Frodo 33 (a “coming of age” for hobbits), they shared a party of special magnificence, at the end of which Bilbo announced that he was leaving the Shire for good and leaving all his property to Frodo. One of the more valuable pieces that Bilbo leaves to Frodo is a seemingly harmless magic ring that he had acquired on his adventures with the dwarves. But this Ring is more than a ring, it is the One Ring of the Dark Lord Sauron, forged to dominate the other Rings of Power. With that Ring, Sauron is nearly invincible, and he is now searching for it again, for he has heard rumor of its whereabouts. Thus begins one of the great adventures in literature. Gandalf advises Frodo to leave the Shire and take the Ring to Rivendell, where its fate can be decided, and shortly thereafter Frodo does just that, with his relatives Merry and Pippin and his friend Samwise. His first appearance is as Bilbo’s son, which was amended in the next draft to his nephew, and then slowly unfolded into its final shape. The name Frodo does appear in some of these early drafts, but it is used in relation to some of Bingo’s companions, ie. Frodo Took, those who would later become Meriadoc and Peregrin. Bingo may very well have worked fine as a name in Tolkien’s intended “sequel to The Hobbit”, light-hearted and whimsical, but it certainly would not have worked as a part of the much deeper and darker tale that The Lord of the Rings grew into. Eventually, as the tale unfolded, Tolkien scrapped the name of Bingo, and decided upon Frodo Baggins as the protagonist’s name. Names were of deep significance to Tolkien, and many were rooted with deeper meanings (either in Old English or in Tolkien’s created tongues), and Frodo is no different. According to The Letters of JRR Tolkien (No. 168), Frodo is derived from the Old English word “fród”, meaning “wise from experience”. “I have been too deeply hurt, Sam. I tried to save the Shire, and it has been saved, but not for me. It must often be so, Sam, when things are in danger: some one has to give them up, lose them, so that others may keep them” (RotK pg 309). The role of Frodo Baggins was played by Elijah Wood in Peter Jackson’s film adaptation of The Lord of the Rings.